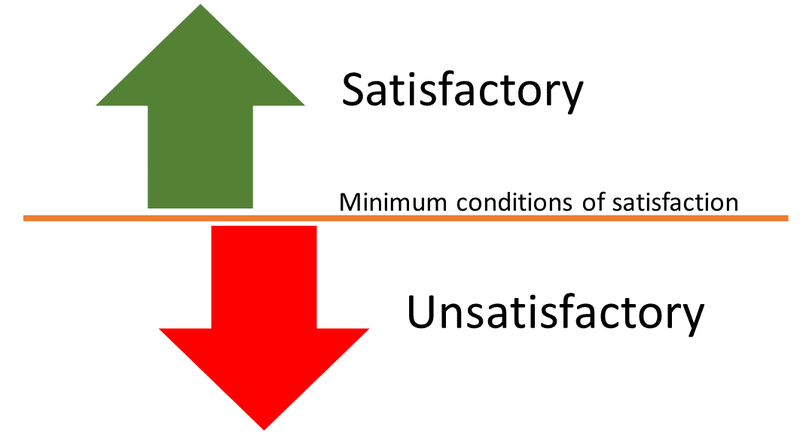 What are the minimum conditions of satisfaction in your company for KM? If you have not set any, then the long term future of your KM activity may be at risk. Knowledge Management becomes embedded in an organisation when everyone who needs to be is involved and engaged. However not everyone wants to be engaged, and knowledge management is always in conflict with other less important but more urgent activity. As a result, people may begin to "skimp" on KM - doing the bare minimum that they can get away with. Although this sounds bad, it's a fact of life at work. There is so much to do, there are so many competing pressures, that people will often focus on any one aspect (KM, quality, risk management) to the extent that they have to. They will follow the rules and the expectations, and very few people can go above and beyond the expectation in every aspect of their work. If you have set minimum conditions of satisfaction for KM, at a level that still adds value to the organisation, then its no problem if people do the bare minimum that they can get away with. If you have not set any minimum conditions, then the bare minimum is effectively zero. People can refuse to engage with KM, and still get away with it. If there are no minimum conditions of satisfaction, then effectively KM is optional; you can do as little of it as you want. If someone wants to do zero KM, that's up to them. Nobody cares, nobody minds. And if KM is optional, then generally it won't get done. Nobody has time for optional activity. If there are minimum conditions of satisfaction, then people are clear about the acceptable standard. They know what is expected of them (at a minimum level, anyway). If they fall below the minimum, then people do mind and people do care. That's the point of minimum conditions of satisfaction - if you don't meet them, then your performance is not satisfactory. So you need to ask yourself, what is the minimum standard that individuals and teams and projects need to do in tour organisation, to deliver a satisfactory level of KM? Do they need to conduct lessons capture for each project? Do they need to ensure communities of practice are active for each key area of knowledge? Do they need to consult the company knowledge base at the start of each piece of work? So they have a role in contributing to the knowledge base, and what is the minimum expected contribution? Define these minimum standards, make sure they are not too onerous but still add value, and ask your management to help you embed these into policies, procedures and expectations. Make it part of a "rights and responsibilities" charter, perhaps, like Oxfam has. But define these minimum standards, otherwise the effective minimum is zero.